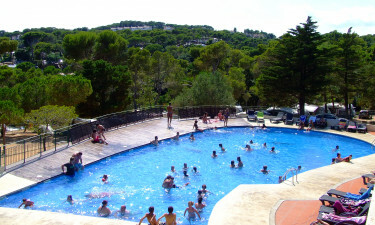 Internacional de Calonge is a holiday camping site found within the Costa Brava region of Catalonia. If you enjoy spectacular temperatures alongside a host of activities to enjoy, please contact Lux-Camp to learn more. It is clear to see why this holiday camping site can be the perfect option for those who are seeking some fun in the sun for their entire family. If you want to learn more or should you need help planning an upcoming holiday, please contact Lux-Camp for additional details. From 16/05 - 20/05 there will be a family festival at Internacional de Calonge, with music, activities and about 2000 people. 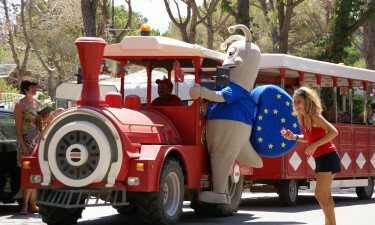 As a guest you have free access to the activities of this festival. Two open-air swimming pools are available. One can stay in a mobile home when visiting. Excursions to local areas and attractions can be enjoyed. Internacional de Calonge defines camping luxury as being able to witness the surrounding countryside. 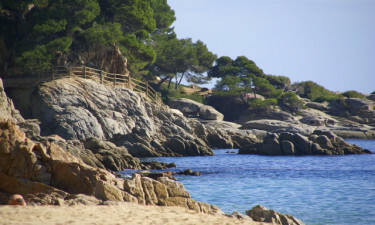 Therefore, guests are able to take bicycle excursions to some of the most picturesque sights along Costa Brava. This is a particularly popular choice during the spring and summer months of the year. One of the foremost attractions of this camping holiday is that the visitor has access to a splendid stretch of coastline. Known as Cala Cristus, this beach is warm and agreeable throughout most of the year. Aquatic activities such as kayaking, surfing and swimming are all available to visitors. Or, one can simply stretch out on the silver sands and soak up the sun. There are a number of on-site facilities that address the needs of the active individual during his or her stay. A few options include the opportunity to play volleyball, football, tennis and golf. Off-site activities consist of hiking, fishing and horseback riding (to name but a few options). 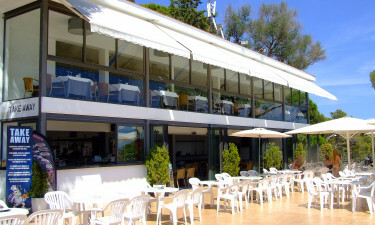 Restaurant Blauverd (Blue-Green Restaurant) is able to provide a selection of sumptuous Catalan dishes as well as foods designed around a more international appeal. There is also a snack bar which serves daily breakfasts. Takeaway orders can be placed at either location. This very same bar provides cocktails and a selection of regional wines for those who wish to relax under the midday sun or enjoy a nightcap before bed. This Catalan luxury camping resort provides its guests with the ability to purchase a variety of local goods and produce. Their primary supermarket supplies fresh fruits and vegetables daily while other essentials can be found here. International newspapers, keepsakes, tourist items and basic camping supplies are also available. A large bakery is offered throughout the peak tourist season. Both the supermarket and the bakery will remain open between early April and late October.